Ok, maybe that was a slight exaggeration (or a lot), but sometimes it just feels that way. About a month ago, Greg and I were out somewhere and I told him that I was almost positive that I broke a bone in my foot because I was in such tremendous pain. The next morning thought, it was gone and pretty much forgotten about until the next time it happened. The pain was always that same sharp pain that felt like I had broken a bone in my foot near where the big toe makes the rest of the foot. The only difference would be how long the pain would linger for. Sometimes it was a day or two and gradually increased until this last time where it was lasting for an entire week. It didn't hurt all the time and never once bothered me when I ran, which I thought was good news haha. It would really hurt if I put too much weight on my big toe and didn't properly distribute throughout my foot. The X-Ray clinic was right there so it was all in one trip. I actually apologized to the nurse in triage because I felt bad taking up a spot for what I thought could be a broken bone. She told me that this was exactly where I supposed to come if I thought something was broken. I wouldn't have normally apologized but she wasn't overly nice to the people in line before me and I was a little bit scared of her. Thankfully she was nice and we had no problems. I had no idea that I even had high arches. What does this mean??? Well it turns out, thanks to google, that people with high arches are more likely to run on their toes then those who don't have high arches. 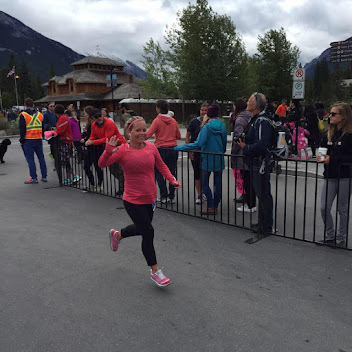 I run on my toes and have done so since I first decided I was gonna run a half marathon back in 2013. People always commented on the fact that I run on my toes so I just assumed I was weird, but as it turns out I am not! Ok, ok, maybe I am weird but it isn't because of this. Why was this a big deal? Is it rare to have high arches? I still haven't googled this so I don't know what percentage of the human population has high arches or if this is even something that is tracked but perhaps one day I will delve into the world of arches. I left completely dissatisfied and decided that their answers were not good enough and immediately went online to make an appointment with my physiotherapist Shari at LivActiv (formerly Running Injury Clinic) because she is always the best at figuring out what is bothering me and how to fix it quickly. I couldn't get in until Thursday so I did some googling of my symptoms which told me I had a bunion and that really freaked me out. I have a friend who has one and I know she has been in a lot of pain for a long time and is currently waiting to have surgery on it. And according to google, surgery and recovery from bunion surgery was awful and not something I wished I would have. I did notice that the majority of bunion cases were female and the reason being is tight pointy shoes. I figured it was a good bet I didn't have a bunion based on that a lone and I was right. I didn't have one. Ganglion which I have no idea what it is or anything. I never googled that one either. I decided at this point to quit googling stuff and just wait until my appointment with Shari on Thursday morning. Coincidentally, the pain had pretty much subsided by the time my appointment came around. 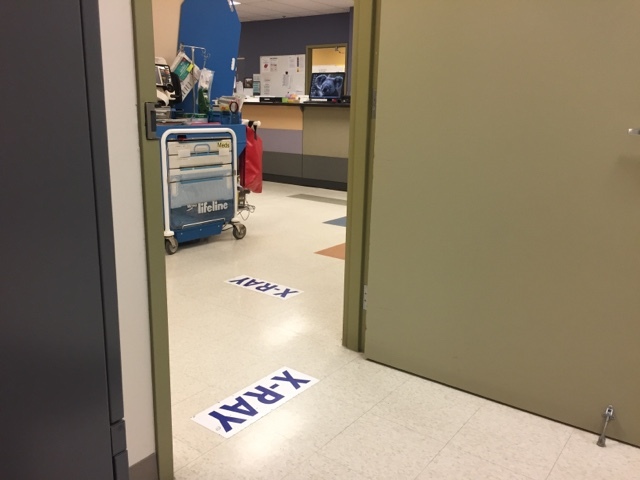 At the beginning of my appointment, I told Shari what had happened at the doctor's office and was hoping that she would be able to figure out what was bothering my foot. She asked me if I had been tested for gout and then had me stand with my feet in a square and then I had to balance on each foot with my eye closed. Then I had to tip toe down the hallway for her to see how I walked. For each exercise I had no pain. So I sat on the bed and she started feeling her way around my good foot and my bad foot. Eventually she noticed that the sesamoid tendon was much thicker on my right foot and normal on my left foot. She said that a tendon runs from my calf down into the foot and along the foot until it gets to the toe. If this tendon is tight in my calf that can make the entire tendon tight. But because of my high arches I never felt the tightness there, just in my toe area. And my calf, lets be honest, I felt it there too kinda but not bad enough that gave me any concern. When she massaged the ball of my foot, I nearly died. The pain was extraordinary. She kept doing that and moved to the calf of that leg and massaged there. It was kinda tight but not in a painful kinda way. The massage in that area felt kinda nice. It turns out I had sesamoiditis which is the inflammation of the bones and surrounding tissue. It can trigger the sudden onset of pain, but it is far more common that the pain builds up over time. A lot of runners suffer from this because the ball of the foot is subjected to increased pressure and strain. It is also quite common that runners with high arches to suffer from Sesamoiditis. 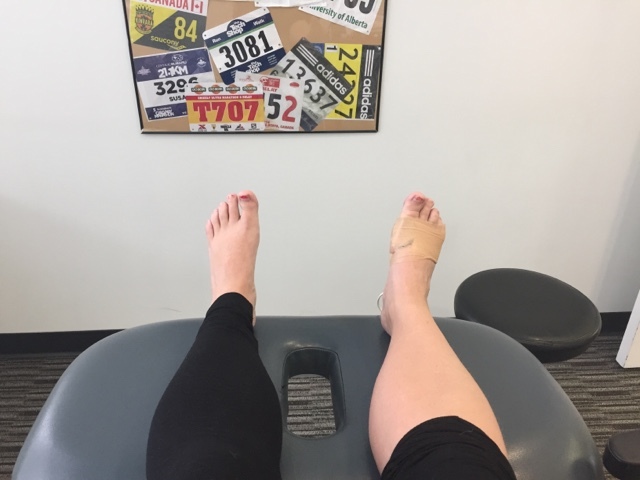 After she massaged the tender areas, she did ultrasound therapy to help reduce the inflammation in the tendons and bone and then electrode therapy. I have electrode therapy and almost all possible areas of the right leg but to have it on my toes was a very strange feeling. 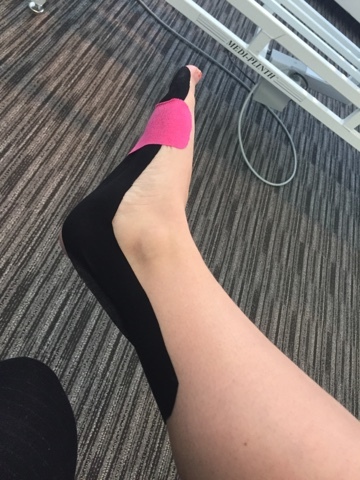 She taped up the area to help apply pressure to it and advised me to roll out calves every day with a roller and to roll my foot on a ball to help stretch it out. I usually switch between a tennis ball and a golf ball depending on how brave I am. The tennis ball is a much more friendly option. I also have to do the stretch below and try to put most of the weight on the toes beside my big toe so not to fracture the sesamoid bone. I go back on Wednesday next week to follow up. Ecentric calf raises will also help out my calves and achilles tightness too which should help the sesamoiditis if that makes sense?